This is the final performance reports from the Performing Arts Workshop to the U.S. Department of Education about Project ARISE (Arts Residency Interventions in Special Education). The report includes performance measure data for the Arts in Education Model Development and Dissemination (AEMDD) grants program. The ARISE Project offers public schools weekly artist residencies lasting between 25 and 30 weeks in theater arts and creative movement for third to fifth grade students. Classrooms participating in ARISE are identified as Special Day Classes or general education classes with special education inclusion (or mainstreamed) students. The ARISE residencies emphasize critical-thinking while engaging in the creative process. 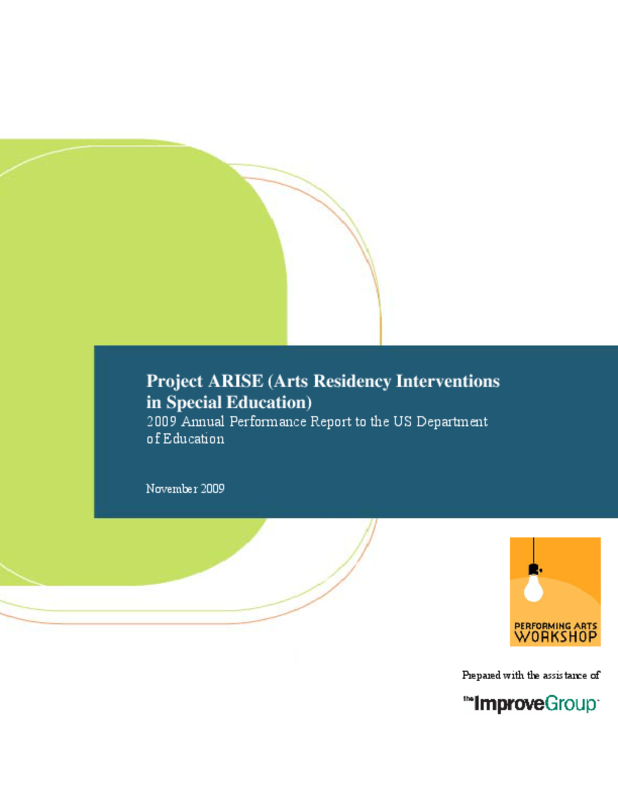 Over three years from 2008 to 2010, the Workshop provided ARISE residencies to 63 classrooms from five schools within the San Francisco Unified School District. 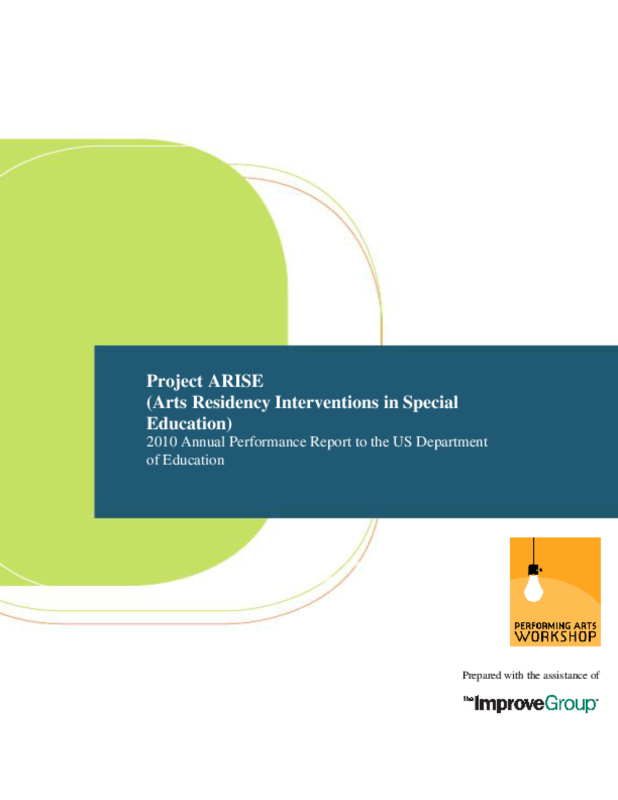 This is the third of three performance reports from the Performing Arts Workshop to the U.S. Department of Education about Project ARISE (Arts Residency Interventions in Special Education). The report includes performance measure data for the Arts in Education Model Development and Dissemination (AEMDD) grants program. The ARISE Project offers public schools weekly artist residencies lasting between 25 and 30 weeks in theater arts and creative movement for third to fifth grade students. Classrooms participating in ARISE are identified as Special Day Classes or general education classes with special education inclusion (or mainstreamed) students. The ARISE residences emphasize critical-thinking while engaging in the creative process. In the 2009-2010 school year, the Workshop provided ARISE residencies to 18 classrooms from four schools within the San Francisco Unified School District. In 2006, at the request of The William and Flora Hewlett Foundation, SRI International conducted a study aimed at assessing the status of arts education in California relative to state goals. The final report, An Unfinished Canvas. Arts Education in California: Taking Stock of Policy and Practice, revealed a substantial gap between policy and practice. The study found that elementary schools in particular are failing to meet state goals for arts education. In light of these findings, The Hewlett Foundation commissioned a series of follow-up studies to identify policy mechanisms or other means of increasing student access to arts education. This study, focusing on the ability of school districts to leverage support for arts education through partnerships with local arts organizations, is one of the follow-up studies. Partnerships may allow for the pooling of resources and lend support to schools in a variety of ways including artists-in-residency programs, professional development for teachers, exposing students to the arts through the provision of one-time performances at school sites, and organizing field trips to performances and exhibits. According to the California Visual and Performing Arts Framework for California Public Schools, partnerships among districts, schools, and arts organizations are most successful when they are embedded within a comprehensive, articulated program of arts education. Questions about the nature of partnerships that California districts and schools have been able to form with arts organizations, and the success of these partnerships to increase students' access to a sequential standards-based course of study in the four arts disciplines, served as the impetus for this study. 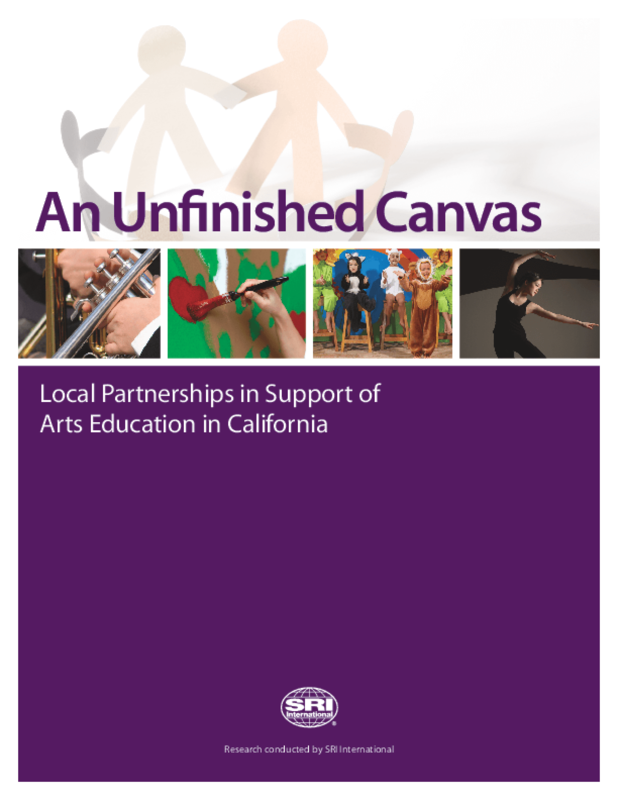 A team of SRI researchers conducted case studies of partnerships between districts and arts organizations in six diverse California communities in spring 2008. 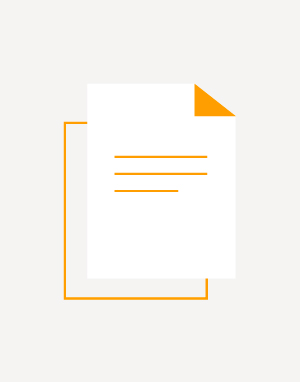 The case study sites were selected for their particular arts education activities and diverse contexts and, as a result, do not offer generalizable data about partnerships between school districts and arts organizations in California. Instead, we highlight the ways that a sample of partnerships promotes arts education in California elementary schools to inform others who may be interested in building partnerships between school districts and arts organizations. Questions about district leadership and capacity -- particularly in light of the new funding -- served as the impetus for this study. Through a survey of leaders in 385 districts, we assessed districts' capacity with respect to arts education, explored early spending choices, and examined the relationship between the two. We also studied changes in arts education since the new resources became available and worked to understand the barriers that continue to stand in the way of comprehensive arts education for all California students. 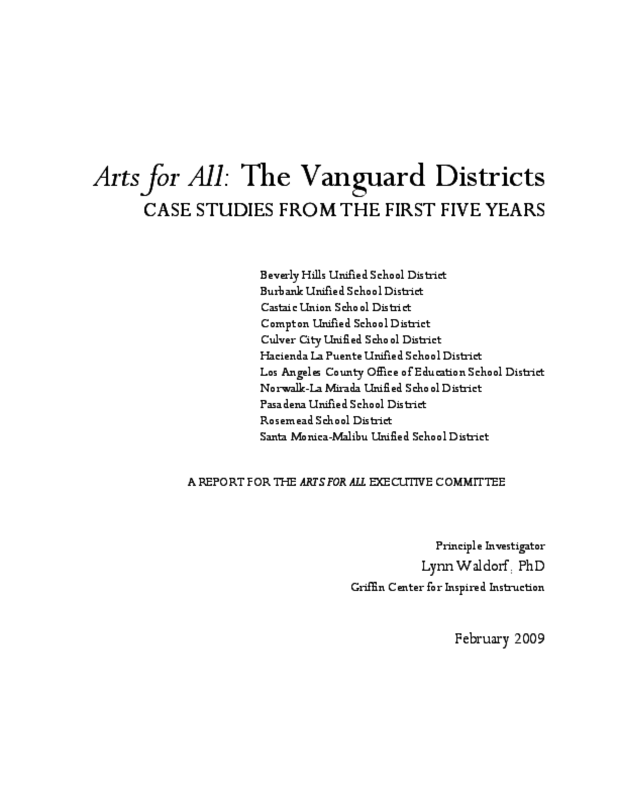 Arts for All: The Vanguard Districts -- Case Studies from the First Five Years fills a gap in our knowledge about arts education efforts. There is a robust and rigorous body of research on the impact of arts education on students but there is sparse research on the effective strategies for implementing, sustaining and stewarding arts education efforts. Not since Arts Education Partnership's (AEP) Gaining the Arts Advantage (1999) has there been a comprehensive study of how school districts animate the arts in their schools. We believe these case studies and subsequent cross-case analyses offer new insights about the differences between planning to restore arts education and making that plan a reality. The 2008 Arts Education Performance Indicators Report shows an increase in the number of school districts that are building infrastructure in this area, demonstrating a long-term commitment to improving arts education. 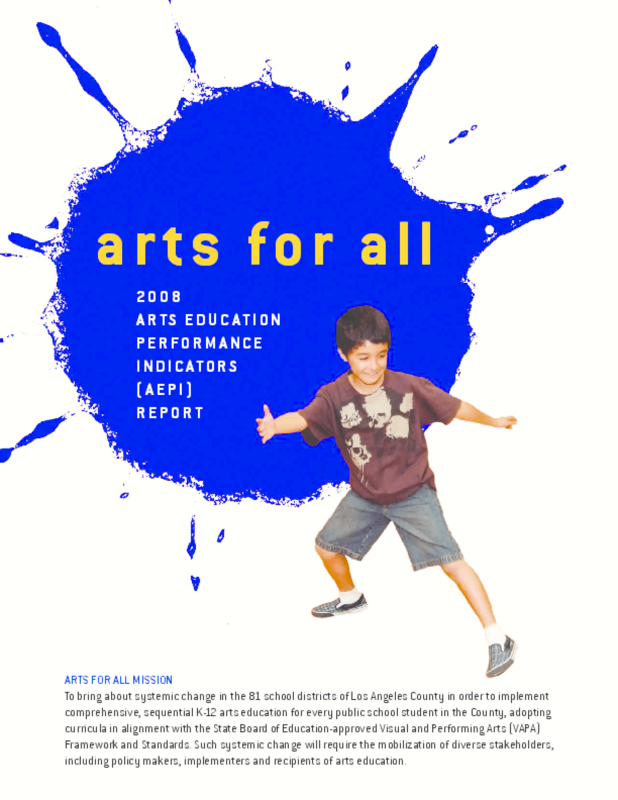 The report is issued periodically by the Arts Commission as part of the county's regional Arts for All initiative to return quality, sequential arts education to the county's 81 school districts. Overall progress includes: 64 percent of districts report having an arts education policy, compared to 37 percent in 2005. 61 percent of districts report a board-adopted arts education plan or indicated they are developing one, compared to 35 percent in 2005. 39 percent of districts report having an arts coordinator, compared to 12 percent in 2005. 16 percent report having a 400 to 1 ratio of students to credentialed arts teachers, compared to 10 percent reporting that ratio in 2005. 98 percent of districts report using general fund budgets to support arts education programs (sources of arts ed budgets were not included in previous surveys). The 2008 AEPI Report is based on self-reported data from superintendents, assistant superintendents, directors of curriculum and/or district arts coordinators. Of the 81 school districts, 72 responded.